Are you trading time for money? When you started your business, did you envision a day that your business would support you and run without you doing everything? Depending on the business you have, you may or may not have considered the need for expansion at some point. Solopreneurs abound in every industry and usually have to carry the ball until revenues allow for hiring staff or moving into a bigger facility. Unfortunately, many people never consider making the leap from solopreneur to business owner and don’t plan their next moves resulting in an endless cycle of trading their time for money. If you always imaged building a business that was not dependent on ‘you doing it all’, there are a few things to think about in order to make the leap from solopreneur to business owner that can support more business without breaking the bank in increased costs of operation. Unless your business is a temporary strategy for making money until your dream ‘job’ comes along, you need to think about where you want to take it. Take some time to write out your vision for your business in as much detail as possible. Include the revenue you want, the kind of customers you want to work with, the organization you will need to support it and the rewards you will get to support your personal life for your efforts. Give your vision to someone who knows you and ask them to critique it and if necessary, refine it. At this stage, don’t worry about how you will get there or the things you don’t know how to do to make the leap from solopreneur to business owner. What’s important is to visualize the end game. If you do, you will strive for what you want. If you base your vision on what you have and know today, you will most certainly fall short regardless of your effort. 2. Does your mindset support your role in your future business vision? Most of us have a preconceived mental picture of our role in our business. In the beginning, we are the business. We find the customers, we deliver the service or sell the product and we provide the support in between. As the business shows signs of growing, our roles will change. If employees are involved, contractors hired, or systems invested in, are you prepared to delegate more? Are you willing to share what you know (training others) in order to serve more customers and keep the experience consistent or are you more comfortable keeping your system close to the vest. In order to make the leap from solopreneur to business owner, your mindset will have to go from ‘primary doer’ to ‘owner of what the business provides’. It’s a subtle difference but it’s absolutely essential to transition from ‘I am the business’ to ‘I own the business’. An excellent book that drives this concept home is ‘The E-Myth’ by Michael Gerber. Building a business today has been tougher than any time in the past 3 decades. And while many business owners are staying the course and making their companies work, it takes a level of effort and desire rarely displayed in a job working for someone else. Giving yourself time to build your business correctly means understanding the financial commitment involved as well as the approach needed to build a sustainable operation. Get help from people who can help you figure these areas out so your commitment is backed by confidence in your plan. Many times, a simple business plan can provide the starting point. Spend additional time projecting your costs and sales so you will be prepared to go the distance. You will also want to spend time developing a growth strategy for your particular business so you can stay on track and make the leap from solopreneur to business owner. Your commitment will be easier to maintain if your vision is meaningful and your support is solid enough to last during the ups and downs of getting to a level of sustainability. One of the biggest challenges any solo-preneur gets into is creating a business model that is not sustainable. Think of any service business operated by one person who charges by the hour. If this person wants to have a $500,000 per year business but charges $50/ hr. (market rate) for their service, there’s not enough time in the day, week or month to get there. Ask yourself, can my business be duplicated effectively by people I hire so my revenue can grow beyond me? Can I create other services that don’t rely on an hourly billing? If you have no way to replicate your efforts in a manner that’s consistent and affordable so you can take on more clients while ensuring the same, high quality experience, your business model may need an overhaul. Be sure to consider the cost of hiring and training as well as any investment in equipment or facility necessary as a way to insure your fees will produce a profit that supports your ultimate revenue and profit goals. This is where the ‘rubber meets the road’! Making the leap from solopreneur to business owner should be a planned event, not a solution for an immediate crisis. I have several very competent, dedicated clients who found themselves with more business than they could service. Not having a plan to expand their businesses, they simply stopped marketing because they did not want to disappoint new clients. In all 3 cases, we laid out a set of definable points where new business support would overlap increased revenue and decided what would be done to migrate up to the next level. Was it hard? Yes, in a few cases, the risk of committing to a new employee or a larger office was stressful. But following a plan that was designed to handle the transitions is what got them all over the hurdle. If you plot out your various revenue streams (areas you repeatedly make money) and project increased revenues compared to the cost of services more customers, you will be able to spot the natural transition points and be prepared for them before they hit. Moving up to a greater level of business performance is one thing; staying there is another. The most successful businesses today all found a way to automate various parts of their business so they could continue to focus on the future. Remember to automate your systems as well as your processes. Training new employees can be a huge time drain if you don’t have your process well documented so your new person can quickly produce the same outcome. Likewise, invest in systems that will efficiently duplicate rote tasks or allow employees to handle a greater volume of work with minimal errors or disruptions. If you invest carefully, and in line with expected growth benchmarks, the challenges of incorporating new processes into your business’s routine will be much less disruptive. Finally, if you plan to growth with your business and take on the role of a business owner who oversees the entire company, look for support for yourself. After all, planning not to do it all in the future still requires that you know how to get your organization to its final destination. 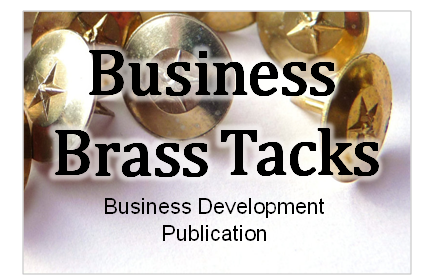 Get Our New Business Building Newsleter- Business Brass Tacks!